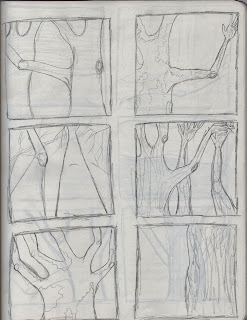 For the next photo shoot I ended up doing some storyboards to plan out my compositions and ideas a bit better. Some of the images show the contrast and position and the use of some props in these images and how some of them might be manipulated later digitally. I took the storyboards with me for the photo shoot to have better reference and direction. With Alastair's help we took some props and a tripod up to the woods one afternoon while the rain had been off. I've been hit by an nasty infection as well causing me to have no voice and fevers so trying to do work and sleep from coughing fits has been a bit of a struggle. But this time of year has proved fruitful towards the project because of the changing season and the type of fauna that's growing. 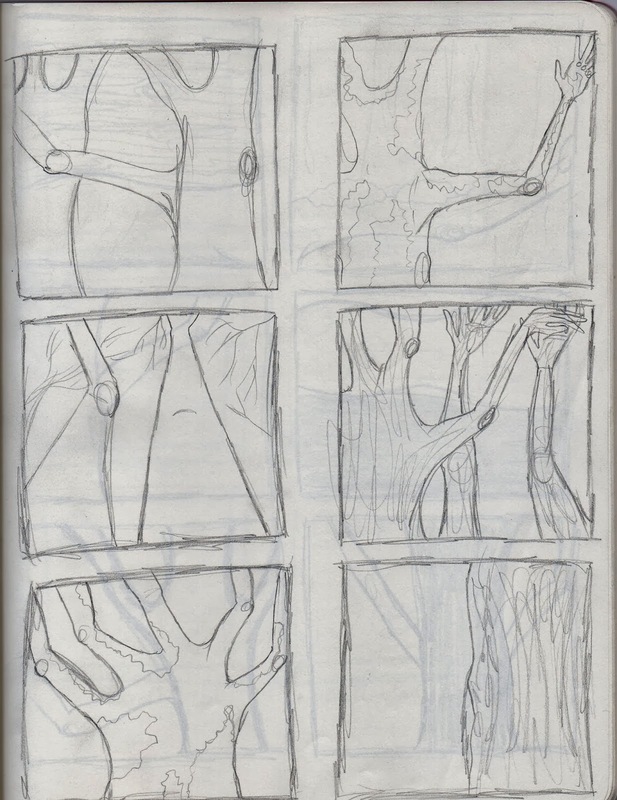 I also found a lot more tree's that I can used later as reference and play around with that resemble limbs in tree branches. This tree and area ended up being key for the photo session and we ended up taking a lot of shots here and playing around with the scene and the layout in each photograph. On closer look in some of these images my hands and arms are sticking out from the tree to represent branches but more subtle and abstract. We then tried some close up shots and to get some of moss and textures in the trees as well some new perspective and compositions. I collected some moss as well and tried balancing some on my arms and hand to try out different ways of representing my body to be part of the natural environment. I would like to try this out with other materials such as bark and paint with other body parts. We also noticed that their was some interesting and earthy roots at the bottom of the same tree and gave me the spur of the moment idea to try my arms as roots too. It was a little tricky and damp not to mention that after I lay down for a while I must of disturbed some insects. Their was eventually lots of spiders, beetles, and moths crawling over me hope I didn't squish any. Their was another idea I had to try giving identity trees and doing it the other way round of giving them ways to identify them as human since I've been imitating parts of them. So I went round charity shops the week before and found some clothing that I felt represented female and male identities. And could be placed on trees a little more easily than some other clothes. This set of photos are more feminine and I would like to try some contrast shots with the same article of clothing on myself or models. We also tried to make a Mr Tree with a tie and shirt combination and was interesting because we were thinking of story that involved the two trees while dressing them. And it backs up the whole theory of because of empathy that we try to relate and create relatable characteristics in other things. While we were taking these photographs their was a squirrel nearby collecting nuts for the winter and eventually he ended up above us and it started raining nuts over head. It was like he was attacking us to get out of his wood ha ha. Trying to dress a tree was actually a lot harder than it looked had some trouble getting the branches through the selves. Close enough I'll try this technique with some more other trees and parts of clothing if it shows to be successful enough. 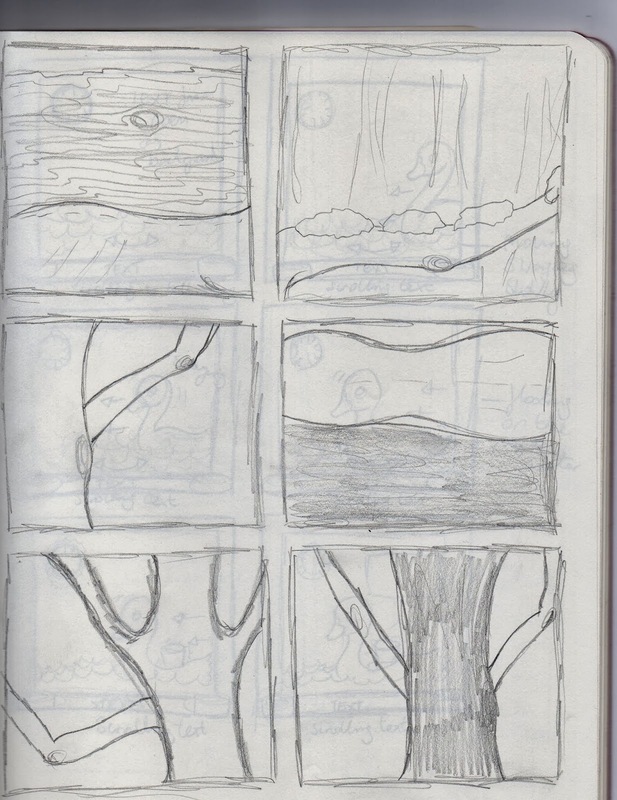 I found some more other trees that I could possibly use in digital manipulation to add limbs or use the branches as a guide. Their was so many beautiful fungai this time of year and I had to take some pictures of them for more resources in case I might end up using them as props or in some digital manipulations to add to my limbs. I'll take some of these pictures into Photoshop and start adjusting and manipulating these images and add limbs to the trees and add colour and textures. I would still like to start filming and maybe dabbling in some sound as their will be more photo shoots in the woods. I would also like to start working a lot more with the materials I've collected and more in my sketchbooks. Our class critique is tomorrow and I hope it goes well and that I get my voice back some what to be able to speak better to everyone. Well see how things go I'll try to work on more sketchbook this work and using some materials this week.